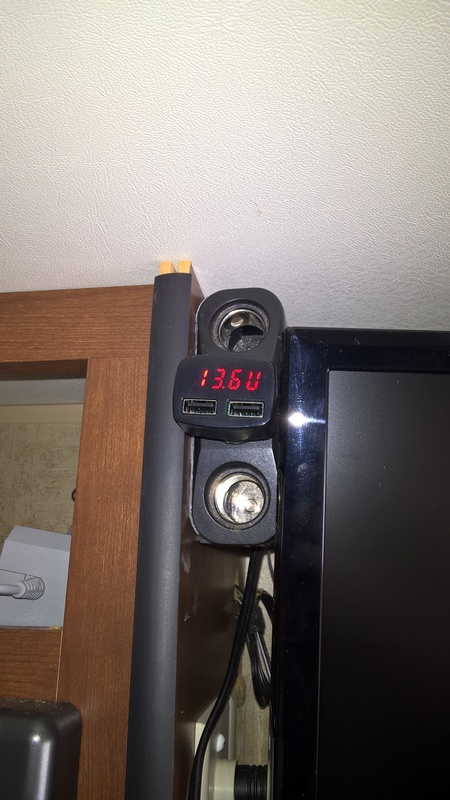 Have you ever wanted to know the status of your Battery and your RV just has a simple 4 Light panel on the control board that tells you 1/4 full, 1/2 full, 3/4 full or full? I found a simple little gadget that not only gives me DC Power readings so I can see if my battery is getting close to the critical 12.1V mark when off grid. First some background, I have a shelf that is right beside my TV mount that has the standard TV Amp button and Cigarette Lighter plug on it. This has been designated my tech shelf, I have my router attached to a WIFI antenna on the roof, I have an old Wii (for rainy days), and I have a Cell Amp/Hotspot setup there. The Router, Amp, and Hotspot can all run off DC. So I decided that I wanted more DC plugs in that area. So I started by getting a Cigarette Lighter 3 way plug with a few feet of cord. I mounted it to the side of the shelf and plugged it into the TV Cigarette Lighter plug. This gave me a way to run my router which I modified to run off a Cigarette Lighter plug instead of a DC power brick. The hotspot and amp both run off USB, so I figured instead of an AC power brick, why not use a DC cigarette power plug in the 3 way I just installed. I spent some time looking for the perfect one. I wanted it to have 2 USB plugs, and be rated to charge an iPad, so minimum 2.1 amps per plug. I ended up finding one on eBay that fit my needs but also addressed another need that I wanted. It had a display that cycled between room temp, DC volts and DC amps. So now I have lots of plugs on the shelf to run/charge devices off my house battery without the need to use an inverter and I can also monitor my battery level fairly accurately. Just remember, 13-14 volts is normal when charging, 12.6V is normal standing voltage of a freshly charged battery, but many people don’t know that once you hit 11.9V you are at 40% of the battery’s capacity. Beyond this point you risk damaging the battery and should never go below this point.